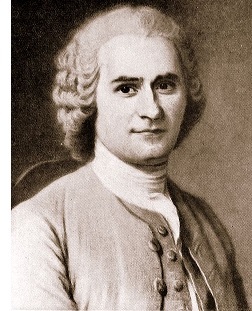 Jean-Jacques Rosseau (1712-1778) - Genevan philosopher whose writings played a major contribution to the French Revolution. He and René Descartes are the two giants of philosophical thought in the Early Modern Period, and yet they were on opposite sides of the philosophical spectrum. Descartes was known as a rationalist, which argued that reason is the primary source of intellectual development. Rosseau, on the other hand, was an empiricist, which argued that the intellect is stimulated primarily by experience. He was different from most philosophers, both in his day and previous to him, in that he tried to apply his observations to society in order to understand why peoples' lives turn out the way they do, as opposed to simply thinking theoretically. For example, his first major philosophical work, Discourse on the Arts and Sciences (or simply The First Discourse) argues that the intellectual advancement of mankind comes at a cost. The acquisition of knowledge has a corrupting effect on morality. He wrote The First Discourse in 1750 for an essay competition and it was awarded first prize. It was also the work that made him famous. He followed it up in 1754 with his Discourse on the Origin and Basis of Inequality Among Men (or simply the Discourse on Inequality or The Second Discourse). It expanded on his original discourse arguing that man is essentially born with a good nature, but that when inequality results in society (particularly economic inequality), man's nature becomes corrupted. Rosseau further traces the root of this inequality to acquisition of private property. On this front he was diametrically opposed to the philosophy of John Locke and aligned with an earlier English philosopher named Thomas Hobbes. It's easy to see how his writings had such a profound impact on the French Revolution, which was a revolt of the common man against the aristocracy. One of the philosophers who was most influenced by Rosseau was the German, Immanuel Kant.